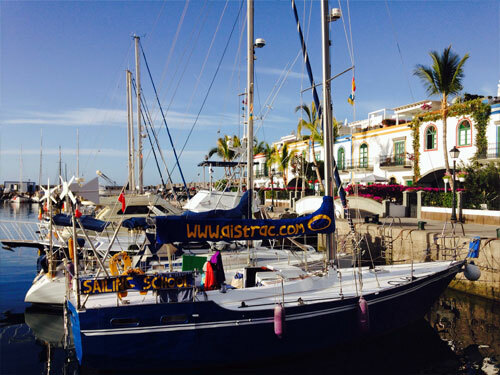 An RYA recognised sailing school, based in beautiful Puerto de Mogan, Gran Canaria, we offer theory & practical sailing courses, skills improvement courses and both bare boat and skippered charter. In order that you obtain the best value for money, our courses can be tailor made to suit your needs – everyone is welcome – we are also members of the RYA Sailability scheme. The course start days are flexible, in order to accommodate flights from all over Europe. We are happy to discuss your requirements with you before you make a booking. Whether it’s a theory class or a practical sailing course, we aim to enable you to learn at your own pace. We want you to have a valuable and useful experience – after all, the purpose of taking a course is to enhance your ability to enjoy sailing with safety and confidence! A warm welcome to AIStraC from Natalie and Joe Mansfield!